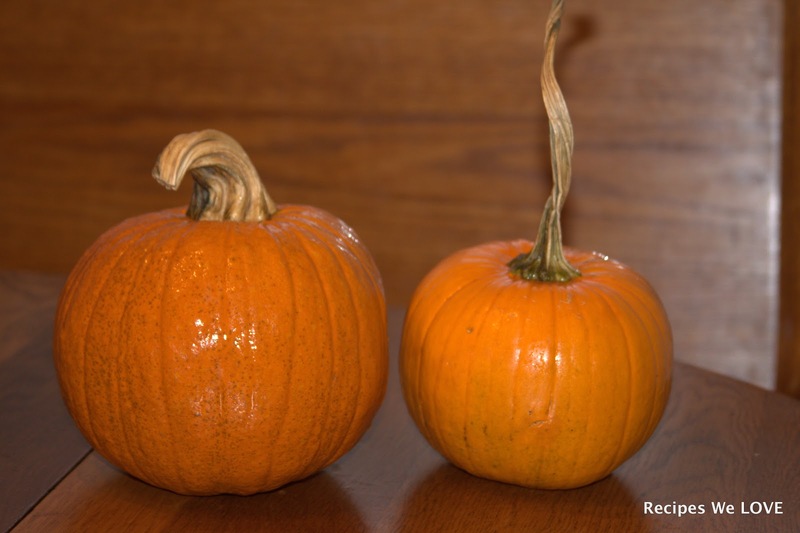 Here are two easy ways to make your own pumpkin puree. I use the same pumpkins that I use for my decorations then once I am ready to take the pumpkins down I cook and save them. 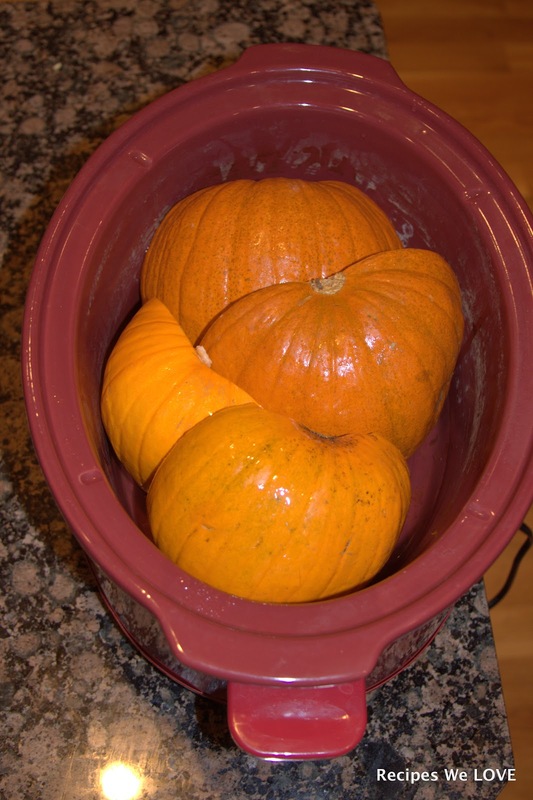 You can find out more about cooking your small pie pumpkins in the slow cooker Here. Just half or quarter your pumpkin. Then clean out all the “gunk” inside, I saved some of the seeds to plant next year and the rest we Roasted for a Yummy Snack.Once the insides are cleaned out just put the pumpkins in the slow cooker with about an inch of water. Cover and I cooked mine on high for about 2 hours. Once they become soft take them out of the cooker and allow them to cool. Then once it becomes cool enough to handle scoop out the flesh and let the liquid drain, I placed a flour sack or cheese cloth in my strainer so I did not loose any of the puree. Once it cooled and drained well put it in your freezable container, I put mine in freezer bags in 2 cup portions. Here Is a baking version. Just half or quarter your pumpkin. Then clean out all the “gunk” inside. Then place cut side down on a baking dish (with a lip since some will release liquid while they cook), then bake at 350 until the give when you push on the peel. This variety let out a lot of liquid and look wilted in the pictures, the orange jack-o-lantern type pumpkin I did the peel stayed very hard and it kept it shape. Then once it becomes cool enough to handle scoop out the flesh and let the liquid drain, I placed a flour sack or cheese cloth in my strainer so I did not loose any of the puree. Once it cooled and drained well put it in your freezable container, I put mine in freezer bags in 2 cup portions.drained well put it in your freezable container, I put mine in freezer bags in 2 cup portions. I am for anything that saves my family money, helps stock my pantry, and this way I know what my family is eating. Yes it takes a bit of time but for me it is worth it. I also get lots of free pumpkins from the garden but I have seen lots of people online getting free or almost free pumpkins the day after Halloween at their local grocery or from neighbors. Here Is a baking version Just half or quarter your pumpkin. Then clean out all the "gunk" inside.